Farmers retail staff want an increase in pay rates so that their families have enough to thrive on and not just survive. Times photo Farida Master. 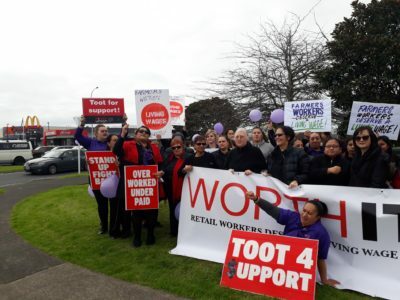 More than 50 employees of Farmers retail stores of Botany, Pakuranga, Manukau and Papakura staged a walk out from the stores last Thursday. They protested at the crossroads outside Pak’nSave, Botany. The beauty, sales and service assistants were part of the strike action nationwide. Workers had decided to move from pickets to strike action in response to failed negotiations. Protesting against low pay and unfair pay reviews, workers at the department stores around the country went on strike from one to five hours in the afternoon. Sarah Thompson organiser of the First Union strike in Botany told the Times: “If you look around, it’s good to know that the majority are women here. And they have never done this before. They are too busy looking after their families and don’t have time for this. It must be pretty serious for them to pick up a picket. Ms Thompson claims that workers get low grades just so that their employers don’t have to pay them more. Farmers’ workers typically start on a near minimum wage of $16.50 an hour, she says. “Currently 80 per cent of Farmers’ workers who belong to First Union are paid less than the living wage. “For most, the pay scale ends around $17.50 with raises only available through performance pay reviews. “Such an iconic New Zealand brand as Farmers should be doing better. We hope to resolve the issue and end the performance pay scheme.